IRVINE, CA, NOV 7, 2017 – The Council on Aging – Southern California (COASC) is proud to announce its twentieth year anniversary of the Financial Abuse Specialist Team (FAST) in Orange County. Approximately 1 in 10 Americans aged 60+ have experienced some form of elder abuse, with financial elder abuse being one of the fastest growing crimes in America. FAST has provided two decades of outreach and training to help protect community members against scams and fraud. COASC will commemorate the occasion with a celebratory anniversary event on Nov. 14. Orange County FAST is a partnership of public and private multidisciplinary professionals who volunteer their time to facilitate comprehensive services to victims of financial elder abuse. Representatives include law enforcement, the probate court, public and private legal services, medical and mental health professionals, Adult Protective Services, Long-Term Care Ombudsmen, Public Guardian, Department of Health Services, Department of Social Services, Social Security, the Attorney General’s office, Alzheimer’s Association, Regional Center, and members of the financial community including bankers, real estate, insurance, and financial planning professionals. The Financial Abuse Specialist Team (FAST) was created in July 1997 as a program under the Council on Aging. FAST collaborates with Adult Protective Services (APS), Ombudsmen and attorneys to provide monthly training and consultations on financial elder abuse for professionals who serve the senior community. In the early 1990s, the Los Angeles Police Department Elder Persons Estate Unit designated financial elder abuse as “The Crime of the ‘90s,” and helped to establish the first FAST for the County of Los Angeles. This was the multidisciplinary model followed by the Orange County FAST. Many other counties nationwide followed this model and are still active today. Financial exploitation is often the source of other forms of abuse, however, APS, Ombudsmen, social workers, and RNs are more familiar with investigating and resolving complaints of physical abuse and neglect. FAST is the perfect resource to enhance the services of both programs. 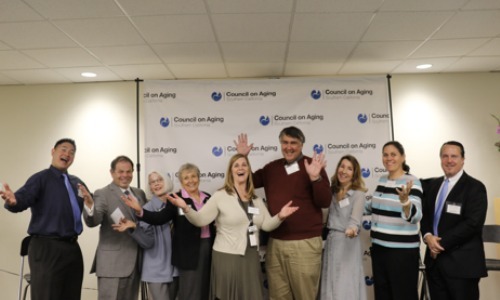 The Council on Aging – Southern California has been a trusted 501(c)(3) nonprofit organization since 1973, providing unbiased information, programs and services to more than 290,000 adults and families annually. We promote the independence, health and dignity of older adults through compassion, education and advocacy. Every day we help seniors remain healthy, connected and protected.